Kids have a special relationship with the old soothers that used to mean so much to them. So why not find a way to re-use them rather than simply throwing them away? Welcome to “upcycling”! Have a look at the many creative ideas we’ve included in this section, from handcrafting attractive gifts for friends or family to making your own soother flip-flops! Let your imagination run wild. We have also produced our own MAMdala colouring book, featuring our cutest soother designs to colour in. Print out as many as you want and take them with you wherever you go. 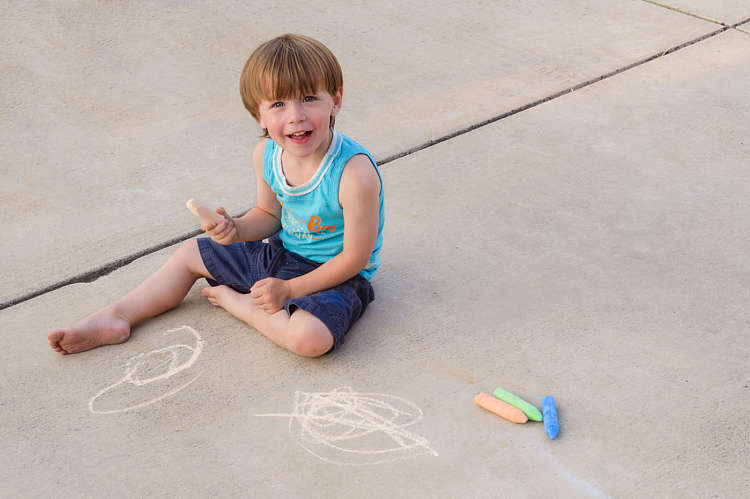 They are always the ideal distraction to keep kids occupied when you have something else that needs your attention – plus they help to develop your child’s creativity at the same time. Soothers are something special! And the relationship with them is a very emotional one: the soother consoles, soothes and is loved by babies and parents. But what do you do when the time has come to say goodbye to it? 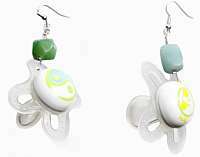 We at MAM think our soothers are much too nice to be thrown away! This is why we created the MAM modelling corner. This is where soothers are given a new life in a creative way. Be inspired by our ideas for modelling. Whether you are young or old, there is something here for everyone. Our ideas range from refined earrings and picture frames to creative packaging for gifts. 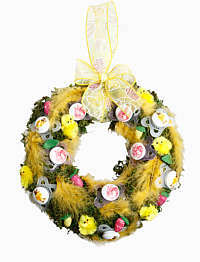 Use a hot glue gun to attach decorative moss to a Styropor wreath. Cut off the teat entirely. Glue the soother shield and any decorative material you want onto the decorative moss. A unique gift idea, perfect for a new birth. Then feed the soother onto the wire. Now push the wire into the hollow cavity in the soother shield. Wrap Floratape around the whole of the wire stem. Now attach the silk flowers to the wire stem with Floratape. Then cut out leaves of felt moss and place them on the wire stem. 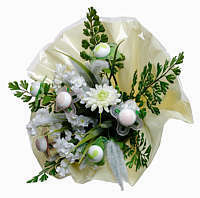 Finally arrange the flower and soother stems into a bouquet. Just a few actions will transform your hair band into a real eyecatcher. The best photo of your baby is perfectly showcased with the decorated soother frame. Cut off the teat of the soother entirely. Now stick the remaining soother shield onto the surface of the picture frame using a hot glue gun. Then allow the decorated picture frame to dry really well. The bottle plug keeps the content fresh and also protects it from annoying little animals in summer. Cut off the tip of the teat and pull this over a new plastic cork. To ensure that the teat has a good hold, simply attach the trimmed edge of the teat to the cork using sticky tape. A decorative tea-light holder that creates a soothing atmosphere in the evenings. Connect the soother shields using a clear fishing line. Then adjust the length of the line to the length of the circular arc around the tea-light holder and then connect the two ends together to form a knot. Finally cut off the excess length of line. Refined earrings that enhance any outfit. First connect the earhook and soother shields with a piece of flexible wire. The soother can then be removed as often as you wish. 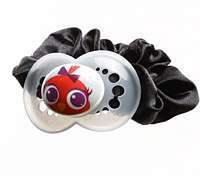 When the soother is no longer required, it makes the ideal accessory for shirts and jazzes up any item of clothing. First of all, cut off the teat of the soother entirely. Then sew on the soother shield. 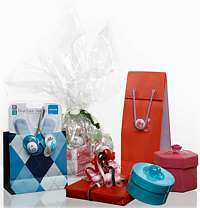 Thanks to soothers that are no longer being used, gift packaging now looks great at any party for babies. Then stick the soother shield onto the gift packaging. 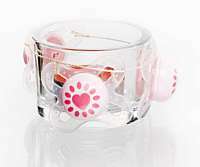 This allows the soother shield to act as a button or decoration. Ideal for hot summer days. Now stick the remaining soother shields onto the thong with a hot glue gun. This cute butterfly serves as a decoration to stick on plants. Form the first piece of the flexible wire into an L shape. On the back of the soother shield there are two hollow cavities. The bent piece is pushed into one of them and fixed in place with a hot glue gun. In the next step, the second piece of wire is wound around the head of the soother and two antennae are formed from the ends. Along with a picture cube, soothers which are no longer used are turned into a beautiful nursery decoration. Now stick the remaining soother shield onto the existing surface using a hot glue gun. You can design your picture frame to your individual taste using other utensils. The MAM Soother Shield Template allows little children to draw charming animals or imaginative shapes. The fantastic soother shield template is ready. The instructions given here represent a suggested way of producing the model which is depicted. These instructions were not compiled by MAM but were instead provided to MAM by third parties and are passed on by MAM to interested customers. Please note that the model can be created to look at, but is not intended for actual use as a product. All specifications are provided without guarantee and without any claim to be complete. You create the models at your own risk. After they have been turned into models, the soothers should never be used as soothers again – please make sure that they are kept out of the reach of children. Our cutest soother designs are now also available to colour in! The MAMdala colouring book is the ideal companion for busy everyday life with children – whether you are at home or out and about, the templates for colouring in can simply be printed out and put in your bag. In addition, children not only get a great deal of fun from colouring in pictures, they also promote creativity and concentration! Our colouring in pictures can be printed out and used as many times as you want. MAMdala – you can download the MAM colouring book here.